It’s back to school time and I thought I’d share with you some of the things I did (years ago!) to stay on top of my money when at school. If you start building your good money habits when you’re in school, they should stick with you for the rest of your life. The reverse is true as well. Build horrible money skills and you could be stuck with them OR the debt you accumulate due to them. The average Canadian comes out of school with around $27,000 worth of debt and based on an entry level job, the monthly payment will be taking up a significant amount of your disposable income. When I graduated I traveled Europe for three months and then bought my first condo. It was all because of the steps I had taken when I was in school. Make sure that you sew the seeds of your financial success now! 1. Don’t use your line of credit or student loans. If you don’t need to borrow the money don’t. Do everything you can to come out of school without any debt. work 35 hours and go to school (like I did), apply for every grant ans scholarship out there, eat Kraft dinner or noodles every night, do whatever you can do to minimize your debt. Not only will this limit what fun-time funds you’ll have when you’re out but it’ll be a chain and ball for a ton of years after school. 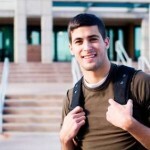 The average Canadian student takes 10 years to pay back their student debts! You’ll have $300 dollar payments or more right off the bat just to pay back your debt. If that $300 went into an TFSA at age 23 you’d have $48,000 at a conservative 6%! Which would you rather have? 2. Get a job that will help you when you graduate. Not only did I learn how to invest like the big guys, make way more than a bartender, but I also made connections that got me a job when I graduated. Who needs four years of booty and booze when I have an entire life of money skills! 3. Get a money mentor. I had a mentor when I was in school who really helped and guided me. It’s easy to get absorbed into student mentality and wake up on pizza boxes every day. All the parties, dating and hooliganism can get you to fall of the wagon. Keeping monthly chats with your mentor will keep you motivated to get good grades, take the correct classes, and know that one day you’ll be at the other end of the tunnel. Plus, they can help you get a job when you graduate in your chosen area. 4. Build your credit early. Get a credit card as soon as you can and set up an auto charging service like internet or your cell phone. Then call your credit card company and ask them to take the payment out of your bank account every month when it is due. Then put the credit card in a safe place and don’t retrieve it until you are out of school and have a job. This will build your credit without every allowing you to pay interest or miss a payment. All you have to do is make sure you always have money in your account like you do for all of your other bills. Having great credit will help you get a cheaper interest rate, rent an apartment, or get credit when you graduate so build and protect your credit like a champ. 5. Don’t take your credit card to the bar. Love your time at school and be sure to be a money monkey!